Of the many local restaurants in the area, Bruce Wine Bar stands out for a very unique and elegant dining experience. Co-proprietor Shaun Edmonstone describes it as a “two floor restaurant that focuses on wood oven pizza and sustainable Canadian cuisine. This award-winning restaurant is located in Thornbury “in the alley behind TD Bank”. It offers a great menu, featuring many locally grown items, and an intimate atmosphere, great for a night out with friends or someone special. Bruce Wine Bar was started by Jennifer and Steven Vipond. After spending 20 years in the veterinary pharmaceutical industry, Jennifer wanted a change and became a sommelier. Jennifer and Steven wanted to create a wine bar and restaurant in Thornbury, so many people could also enjoy their passion for food and wine. Jennifer first met Shaun, a Thornbury native and critically acclaimed chef, at a food festival and they shared their passion for food and Shaun joined their team. 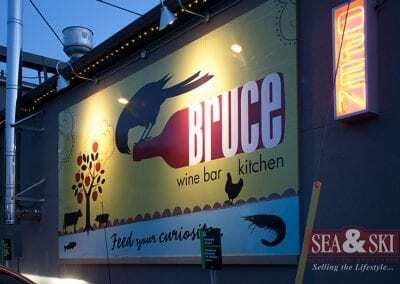 Starting as just a cold kitchen upstairs, only open 3 days a week, the Bruce Wine Bar is now a full kitchen on 2 floors open 5 days a week. The partnership between Jennifer, Steven and Shaun has lead Bruce Wine Bar to be one of the best known restaurants in Thornbury and to be voted the #1 Wine Bar on Trip Advisor. When asked what they are most known for, Shaun responded “scratch cooking”. All of the food made at the Bruce Wine Bar is made from scratch from the charcuterie for their pizzas, their pickling, their pizza dough and beyond. With all of those great homemade ingredients Chef Chris Torgis then ‘makes magic’ as Shaun called it. “He’s able to take and play around with local ingredients and really create something unique on a day to day basis” Shaun says. Moreover, Bruce Wine Bar focuses heavily on sustainable as well as local foods which Shaun tells me is not only important to them but to their customer basis as well. They use products and suppliers from end of the continent to the other but they also use a profound amount of Ontario product. In fact, they are a ‘Feast On” designated restaurant which is a designation from the Ontario Tourism Alliance. They are also members with Vancouver aquarium for a program called “OceanWise” that focuses on sustainability for the ocean and within that, seafood. You can enjoy some great wine, craft beer and ciders from around the world and from right here in your backyard! Local products include Maclean’s, Duxbury Cider, Coffin Ridge Ciders, Georgian Hills Vineyards wines, Side Launch Brewing Co. beers, Northwinds Brewing Co. beers and more. However, not only is the food remarkable but the atmosphere of the restaurant helps contribute to the incredible reputation it’s received. The restaurant is situated in a two storey building. The bottom floor dining area sits right beside the open kitchen, so you can watch your meal being prepared. Upstairs, the restaurant has their fully stocked bar and lots of seating. The lighting throughout the restaurant is spectacular and really contributes to the personal feeling. They have opened their second location “Crow” in Collingwood that is a much larger space, a larger music venue and more of a bar atmosphere. Be sure to visit them in Collingwood as well!